As you are all probably aware, the IWAI Shop stocks an OSNI 1:25000 Activity Map covering Lower and Upper Lough Erne and the Shannon Erne Waterway (SEW) to Ballyconnell. This is an excellent navigation guide and covers in detail pretty much everything a cruising boat might need, apart from the hidey places that require detailed surveys. Its only drawbacks are the small writing, particularly for markers, and being just one chart, it is unwieldy in a boat. The good news – it is now available as an electronic chart, built to fit alongside the CSIG charts using the same Memory-Map software. 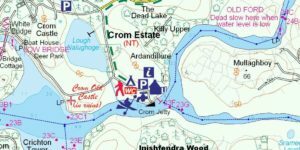 The Lough Erne Activity Map is available from Memory-Map with four other activity maps of Northern Ireland and the overall map of Northern Ireland as well. The purchase price for all is £100 sterling. To order, access the Memory-Map website, look for Maps and then select Northern Ireland. The product comes by post on a CD with the Operating software to drive the map. The same Operating software drives the CSIG charts. Installing it is simple, with step-by-step guidelines. After installation, you will need to activate the charts. Just try to use one, it will tell you it needs to be activated, and then follow the guidelines. You will need to be on the internet for the activation process. Select the map you want, say Lower Lough Erne or Upper Lough Erne, by choosing the Map tab at the top left of the page, and selecting the Map and OK to the pop-up. Once in the map, you can zoom in and zoom out and move anywhere on the chart with the curser. The charts are available for iPhone, iPad, Android and Windows machines, so you have your choice. For tablets, such as the iPad you will need the GPS equipped model, but if you have the less functional model, a Bluetooth GPS can be purchased for about 80 euro. Similarly, for the Windows laptops, a USB GPS is required, I have used the SIRF 3 model purchased from Expansys for €24, but many more models are available. I also recommend you download the free software called GPSGate, which will virtualise your Comm port on the laptop, enabling the single GPS unit to feed two or more programs, and enabling for very easy Comm port assignment. If it sounds hard, it really is not, and feel free to shout me (barge41m@yahoo.co.uk) and I will walk you through it if you run into trouble. The Memory-Map help desk are very helpful, particularly if you have difficulty while activating. I have also built a number of the common routes used on the Erne, which makes the charts much easier to use, and these Overlays (as called by Memory-Map) can be had directly from me. I do update them regularly, but the basic set of Routes is comprehensive. Be aware that the depths shown are spot depths and the contours are only fillers between those spot depths, so do not rely on them. The CSIG has not tested any of these depths and has had no input to the generation of them, you use these charts at your own risk. Now you have them, enjoy them. Click on examples to see full image.